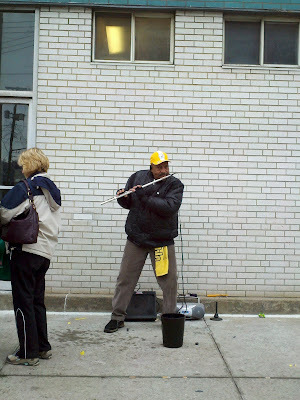 The Strip District may be my absolute favorite neighborhood in Pittsburgh. I have spent countless mornings there, and every now and again, I get really lucky and I can see the years, more than a century of life pass by me -- industry, workers, commerce, butchers, bakers, candlestick makers, immigrants arriving and becoming a part of the place, the population shifting, growing, diminishing, and somehow growing again. It is a beautiful thing and a magnificent place. Truly. 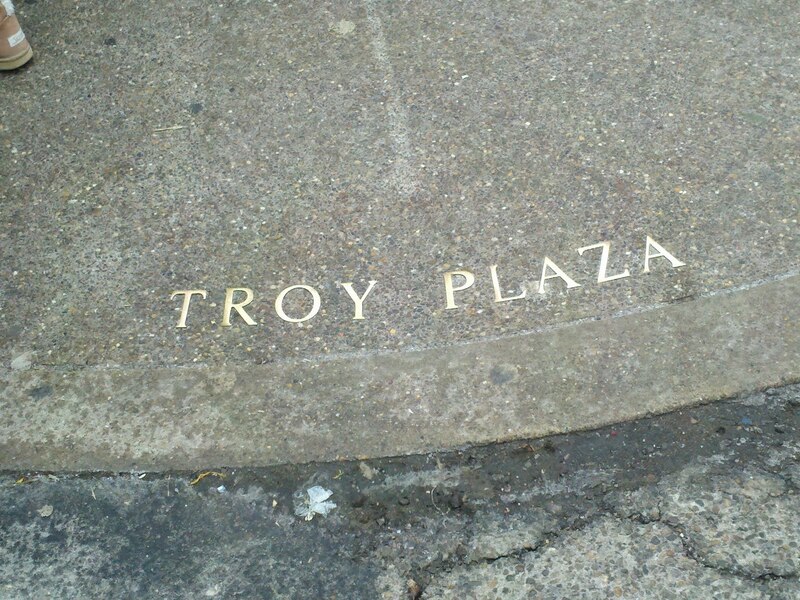 But yet, for all of that time, all of those mornings and afternoons and nights spent there, I only recently noticed this - "Troy Plaza" in brass plate laid in the corner of the sidewalk at 20th and Penn Avenue. Given it's location at the epicenter of sales of all things black and gold -- t-shirts, Terrible Towels, hats, scarves, dog collars, onesies, Troy Polamalu wigs and Brett Keisel beards -- I believe that it should be renamed "Troy Polamalu Plaza." 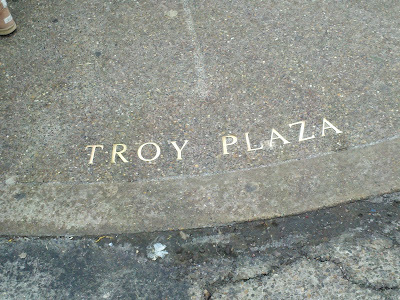 Any Burghers out there know why this is named Troy Plaza? I really do want to know. There were a huge number of Polamalu jerseys being worn this morning (no kidding that guy is No. 1 in jersey sales in all the NFL; at least half the population of Western Pennsylvania has a #43 jersey), but I also saw a good number of other players, both current and old timers represented: James Harrison, Heath Miller, LaMarr Woodley, Ben Roethlisburger, Hines Ward, Jack Lambert, Franco Harris and Terry Bradshaw. I even saw a Ryan Clark jersey, so that was cool. Even though moshing our way down Penn was a bit like salmon swimming upstream (they blocked Penn to car traffic before XL, why not XLV? 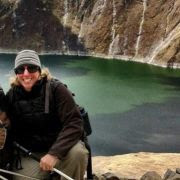 ), everybody was feeling festive, happily waiting in line for biscotti and coffee, cheese and salsas, bread and t-shirts. There was a line out the door for DeLuca's that had to have been 40 people deep. At least. 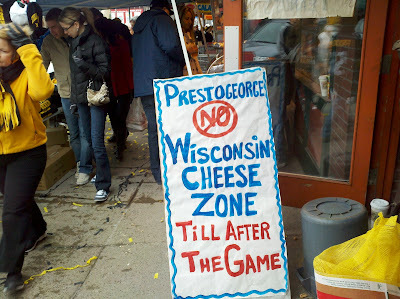 I stopped in at Prestogeorge to pick up some Antigua Guatamala coffee and was greeted by this sign. Best story of the day came courtesy of a friend who was working down at the Pittsburgh Public Market. Sadly, I had just missed it, but a couple was fighting right next to his vendor spot, and not a cute, "Honey, you know I'm right ..." kind of fight. They were fighting, genuinely hopping mad, really yelling at each other. He thought they might come to blows. The subject of the fight? Who got to wear the Brett Keisel Beard. Only in Pittsburgh. Is it time for the kick off yet?